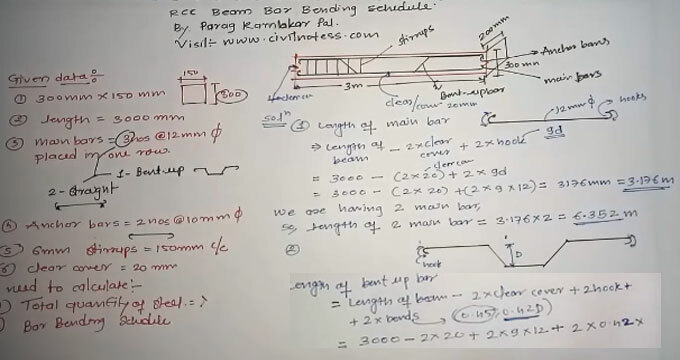 The calculation of Bar Bending Schedule for RCC Beam and the weight of steel need proper method that is described here. Bar Bending schedule generally provides the reinforcement calculation for the reinforced concrete beam and also provides the details about the cutting length, type of bends and bend length etc about reinforcement. As an example a beam of clear length of 3m, 300mm wide by 150mm length has taken. It consists of 3 main bars of 12 diameters which are placed in a row and from the three two of them are straight and one is bent up. The main bars are at the bottom and the additional anchor bars which are also there besides the main bars are at the top. There are two anchor bars about 10 diameters and diameter of stirrup is 6mm space at 150mm center to center. Here the provided Clear cover to reinforcement is 20mm. Now we have to calculate two things: 1) total quantity of steel and 2) Bar bending schedule. Next the length of the main bar has to be calculated and then the length of the bent bar can easily be calculated through the length of the two main bars. After all of this, the length of the anchor bar need to calculation and it will be like the calculation of the main bar. Next the stirrups will be calculated. After that with a diagram the Bar bending Schedule for RCC beam will be calculated.